Raymond M. Lombardi, D.C., N.D., C.C.N. 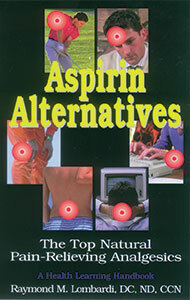 This book discusses analgesics and natural approaches to pain. There are a number of natural alternatives which are equally effective and in many cases may be preferable to drugs because they may help treat the underlining problem rather than simply treating a symptom. The author, Dr. Raymond Lombardi, is a chiropractor who treats patients daily who are experiencing various types of pain. His training and experience as a naturopathic doctor, nutritionist and herbalist, allows him to select the proper approach for the various types of pain, whether it is chronic, acute, inflammatory, degenerative, etc.